The main focus of Henry Gholz’s research into the relationships between the structure and function of forest ecosystems has been the managed slash pine plantations and associated wetlands of Florida. Gholz’s research on gas and energy exchange between forest canopies and the atmosphere seeks to define fundamental biologic phenomena that control important ecological functions in forests while helping to determine forests’ potential role in absorbing carbon released through the burning of fossil fuel and through tropical deforestation. Gholz’s ability to assemble and work as a member of interdisciplinary teams has led to his site being selected as one of 13 in a North American network called AmeriFlux. 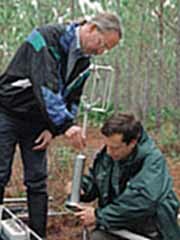 In AmeriFlux, measurements of carbon dioxide, water vapor and energy fluxes over forests are made on a continuous, long-term basis using state-of-the-art micrometeorological techniques. While on a recent Science and Engineering Diplomacy Fellowship sponsored by the American Association for the Advancement of Science, Gholz served as an international forestry adviser to the U.S. Agency for International Development, where he helped define connections between forest management in developing countries and the global carbon cycle.